Last May I had the pleasure of reading and reviewing The Anonymous Bride which was Book 1 in Vickie McDonough's Texas Boardinghouse Brides series. Two Corbett brothers named Mark and Garrett invite a mail-order bride to town for their cousin whom they feel ought to get married. But to enhance the odds, they invite three women figuring only one will actually show up. Surprise! Four women answer the call. By the end Book 1, their cousin is married but the town has too many unattached brides on the loose. - Shannon O'Neil, the petite Irish immigrant who's all alone in the world. - Leah Bennett, the oldest of eleven siblings who's running from any responsibility that includes wet diapers and leaking noses. - Mark Corbett is one of the brothers who invited the mail-order brides to town. He likes Shannon's quiet fire but something in his past grips him in fear of being found out. He knows he's destined to walk his path alone and it's going to be far away in the city. - Mark's brother, Garrett wants to marry the women off as soon as possible so he doesn't have to keep paying their boardinghouse bill. There's no way he's ready to settle into marriage at this stage, but maybe he can arrange socials to bring the area's single people together. - Rand Kessler is the rich rancher who wooed Rachel in the first book but lost out to Marshal Davis. Rand is still on the lookout for a wife. And he has his eyes on Shannon. - Dan Howard is the local livery owner who lives in a small house with his mother. He may be the tallest man in town but he smells like the horses he cares for every day. And to round out the activities, Rachel's daughter Jack/Jacqueline continues to steal scenes as she dances her way in and out of trouble with her 2 male cronies and 1 arch nemesis. Because of all the subplots and interactions, there isn't room in this book to deeply delve into the storylines of Shannon and Leah. But in the space available, the author does a creditable job of portraying the women's dreams and fears. We know why they react the way they do and can commiserate with their decisions. 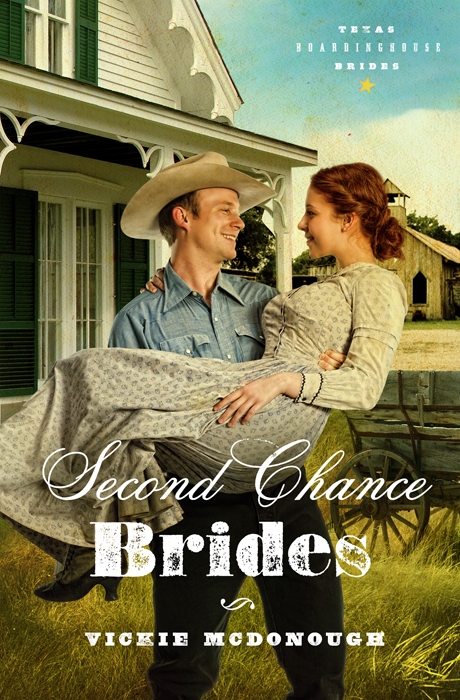 Second Chance Brides is an enjoyable read about western life in the late 1800's. The individual characters stay true to their beliefs and I really liked following their stories. I was delighted to discover that Jacqueline - older and perhaps wiser - will be one of the main characters in Book 3 of this series due out in Apr 2011. I can't wait for Jacqueline's book. Based on the blurb at the back of Second Chance Brides, I've purposely not given the stories away. But using the comment section, does anyone want to guess who picks who? Or if you've read this book, what do you think of series in general? Thanks Anita Mae. I like the way you did this. Oh wait - do you guys have that saying? I don't know where it came from but my step-dad always used to say it. Thanks for chiming in, Deb. I like your reviewing style, Anita! I don't have the patience for character sketches in my reviews. I don't like that about myself either.... But I appreciate the information!! I would like to follow your example a bit more in the future! Book Two looks even better than the first??? This sounds like a fun series, Anita. Kind of reminds me of Here Come the Brides. I'll be putting these books on my TBR list. Yes, Cheryl. I believe book 2 is better than the first. Although I really liked Book 1, there was one little thing it it that bugged me - not enough to mention in a review and no one else commented on it - so it was just my own little quirk. Also, I have a hard time remembering new faces and there were so many in the first book I had to keep going back to see who was who. In Book 2, it's like a visit with old friends and I really wanted to catch up with them and find out what's being going on in their lives. That's why I'm glad the Jack storyline was also included. If you're talking about emotionally, then yes, Rachel's story was heartbreaking. So this book is a lighter read, but that doesn't mean it isn't as good. Ooh, these sound fun! More for my TBR pile... But I love books like these. Hmm, who pairs with who? My guess: Mark and Shannon & Leah and Dan, the horsy-smelling guy. I'm guessing he cleans up purdy good. I agree. Sounds like a fun read. Are you headed the right way? Fill your horn with oil, and GO!